The Walter Cronkite School of Journalism and Mass Communication is a “model for retention, transformative education and inclusion,” a national council said in re-accrediting the Arizona State University program for another six years. The ACEJMC action followed a review by the ACEJMC Committee, which voted in a public meeting held in Chicago to re-accredit the Cronkite School’s bachelor’s and master’s programs. Both the council and committee agreed with the recommendation of a five-member site team, led by Will Norton Jr., professor and dean of the Meek School of Journalism and New Media at the University of Mississippi, to re-accredit the program. 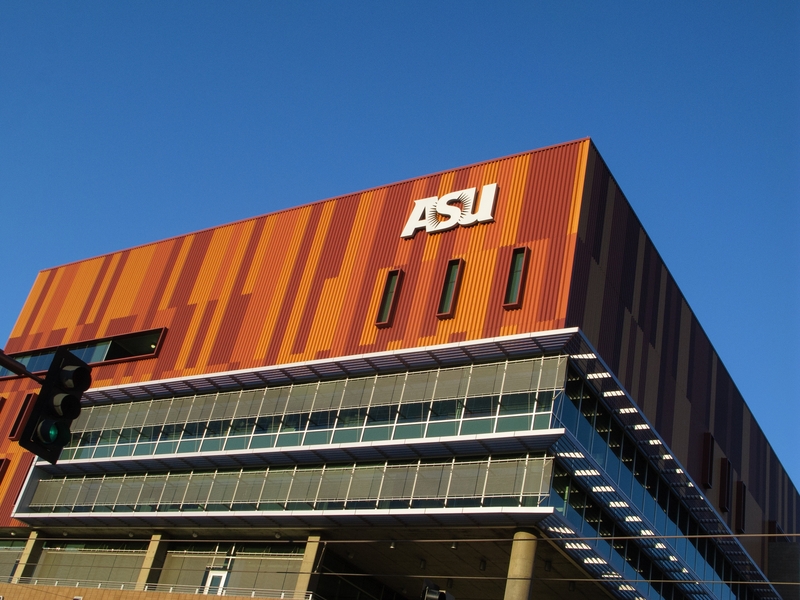 The site team, which conducted an on-site review of Cronkite’s program in January 2017, assessed the school’s progress over the past six years. In its 55-page report, the team offered effusive comments on virtually every dimension of the Cronkite School and cited no weaknesses. The Cronkite School, accredited since 1973, received high marks across all nine accreditation standards, which cover mission, curriculum, diversity, faculty, scholarship, student services, resources and facilities, public service, and learning outcomes. The Cronkite School has dramatically grown since its last re-accreditation in 2011, which was its first as an independent unit at ASU. During the six-year review period, Cronkite assumed operations of Arizona PBS, launched four new degree programs and expanded its professional programs from three to 13, which includes a Washington public affairs reporting bureau, a Los Angeles sports bureau, a borderlands reporting program and a public relations lab, among others. The school also grew its full-time faculty from 35 to 48 — a 37 percent overall increase. Diversity among the student body increased from 31 percent at the beginning of the review period in 2010 to nearly 40 percent in 2016. Faculty diversity also improved, with people of color representing 27 percent of full-time faculty. During the accreditation period, the school hired 15 new faculty members, more than half of whom are people of color and two-thirds of whom are women. Diversity and inclusion also play a significant part in the school’s curriculum and community outreach efforts. In April, the Cronkite School was named the recipient of one of the highest honors in journalism education for diversity and inclusion, the Equity & Diversity Award from the Association for Education in Journalism and Mass Communication. In addition to Norton, the site team consisted of Hubert Brown, associate dean of Syracuse University’s Newhouse School of Public Communications; Jackie Jones, assistant dean of Morgan State University’s School of Global Journalism and Communication; Heidi de Laubenfels, vice president of operations at Nyhus Communications; and Diane McFarlin, dean of the University of Florida’s College of Journalism and Communications. Prior to their visit, team members reviewed an extensive self-study report prepared by Cronkite faculty and staff. During the on-site review, they visited classes and met with faculty, administrators, students and media professionals in the community as well as ASU leadership. For more than 70 years, the ACEJMC has been dedicated to excellence and high standards in professional education in journalism and mass communications. The organization, which accredits more than 100 journalism and mass communications programs in the U.S. and abroad, encourages educational innovation by programs in their efforts to meet accreditation requirements and standards to prepare students for careers in journalism and mass communication around the world. ASU students help Himalayan farmers support their farms beyond the monsoon. In the Hindu Kush Himalaya region, an area that extends 3,500 kilometers across eight nations including Nepal and India, approximately 210 million smallholder farmers engage in a practice known as rain-fed agriculture. However, 80 percent of the annual rainfall in the area occurs during the annual four-month monsoon, so costly infrastructure is required to transport water from distant sources during the rest of the year. This summer, a group of 11 Arizona State University sustainability and engineering students enrolled in a study abroad course organized through the Rob and Melani Walton Sustainability Solutions Initiatives that implemented solutions-based projects to help local farmers support their farms year-round instead of having to migrate to lowlands or to other countries as seasonal laborers. The program was coordinated through ASU's Study Abroad Office. The ASU students were partners with five students from the Tribhuvan University Institute of Engineering in Kathmandu. The course, Grassroots Innovation for Sustainable Development, was developed through GlobalResolve. The student workers, who traveled to a community in the buffer zone around Nepal’s Chitwan National Park, developed hardware during the spring semester and then deployed it while they were onsite in June. To address the irrigation challenge, the class integrated a solar-powered lift irrigation system in the community of Kuleni. Due to declining costs of producing solar panels and solar integrator pumps, solar lift irrigation has the capacity to double the productivity and income of more than 25 smallholder farmers. A 10-kilowatt solar array that pumps approximately 7,100 cubic feet of groundwater per day from a 158-foot-deep aquifer has the potential to irrigate about 50 acres of land throughout the year. Support for the installation, including $20,000 in material costs, was provided by the Kuleni community and a local private company, Sunbridge Solar Nepal. A Nepalese NGO, Local Initiatives for Biodiversity Research and Development, helped to identify the community. Using a cellphone link and antenna, the system operation is monitored remotely from Kathmandu by Sunbridge Solar so they can identify problems and call local technicians for repairs without the difficult and costly commute from Kathmandu. Sunbridge also provided maintenance training to the farmers. “Over the decade of experience that I have working in agriculture and rural development in this region, I have learned two things: Smallholder farmers have the ability to feed themselves but they cannot do it alone, and that technological and social innovation customized to location-specific needs of smallholder farmers can be part of the solution to lift people out of poverty, empower communities and ultimately contribute to regional geopolitical stabilization,” Chhetri said. ASU students worked with local stakeholders in Nepal to install affordable solar panels as part of a powered lift irrigation system to store water beyond the region's annual monsoon. Fresh water pumps through the newly installed solar lift irrigation system, a project of the ASU Grassroots Innovation for Sustainable Development course conducted by the Rob and Melani Walton Sustainability Solutions Initiatives and GlobalResolve. Professor Nalini Chhetri and Cathy Clifton from ASU are joined by local leaders and stakeholders for the ribbon cutting of the newly installed irrigation system. This irrigation system can be controlled remotely, allowing for better year-round management and maintenance.